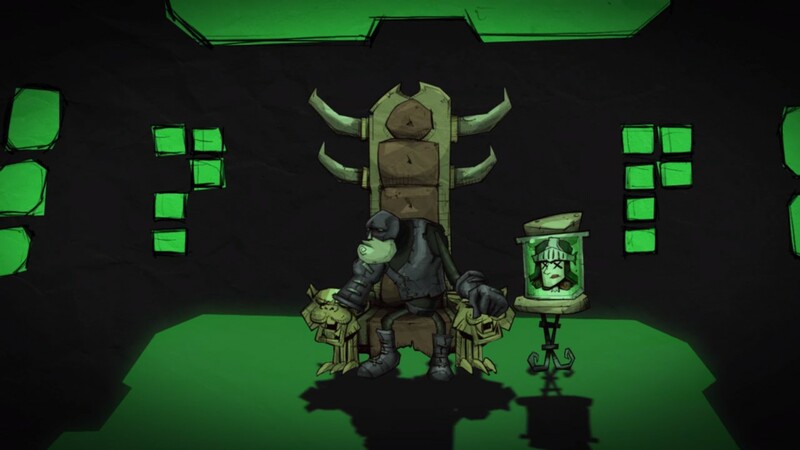 UPDATE: The DLC has been unlocked, which means extra goodies are now thrown in as a bonus, including DLC packs for Beat Hazard (which makes the game way better), Madballs and The Baconing. Groupees is back, and they aren't fooling around this time. After a rocky start to their last package, the Be Mine bundle has been souped up and primed for another round in the bundle ring. And it is quite a bundle indeed. This time, the focus is all about feeding the hungry; bundles are measured in meals for hungry folks. For every two dollars you pay, that covers a meal for someone in need. The bundle itself is a two meal/four dollar minimum, with five meals netting you a bonus game and some other goodies. 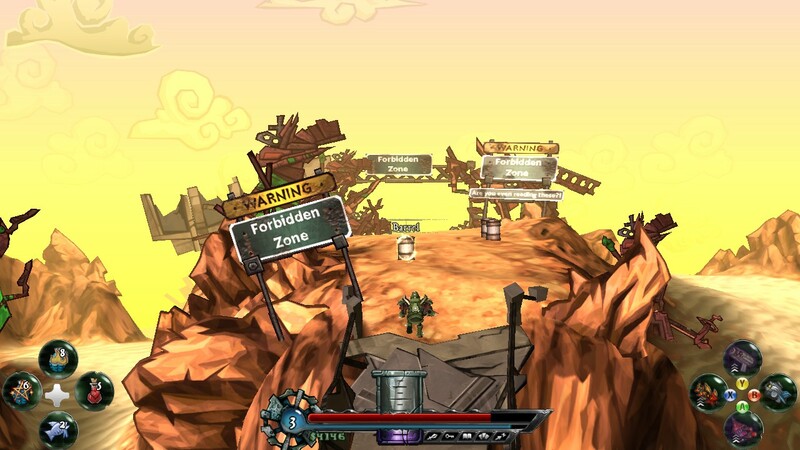 The bundle is generally limited to Steam keys, with Beat Hazard and Sol Survivor offering DRM free options as well. For people who like computers with fruit logos, Beat Hazard, The Baconing, Madballs and Killing Floor all work via Steamplay, so you can join in too. So what are you getting for your charitable donations? Find out past the break. Despite his curious absence from the title, The Baconing is indeed the third title of the DeathSpank series. The series, first developed under the grumpy watchful eye of Ron Gilbert, is basically intended as a Diablo style hack and slash with some elements copped from adventure games, particularly the over the top humour and hot use item on item action. I've only played the demos of the other two games, but they were generally pretty funny, and included a fun combat system centred around the use of tons of weapons at once. The Baconing returns again to this winning formula. While it helps to play the prior games to pick up on some of the weirdness and the in jokes, it certainly isn't required as the writing is so absurd you generally feel bewilderedly amused all of the time anyway. To quickly recap, after vanquishing evil and engaging in a lengthy Ultima IV parody, DeathSpank has retired to his city of Spanktopia to sit and pout about being bored. Suddenly evil robot orques attack the city, and DeathSpank jumps back into action for what seemed like a Ultima IX-but-actually-fun parody. It's pretty obvious the storyline isn't the focus here, but the writing certainly is. It's a really funny game, and I was laughing out loud enough to get glared at by my girlfriend. Not every joke lands, but there is some kind of gag or one-liner in nearly every speech box, so even a couple of duds get drowned out in some genuinely hilarious zingers. The voice acting is great too; the voice actor, Michael Dobson, nails every line thrown at him with the right amount of bombast and arrogance that you can't help but laugh at his heroic battlecry of "Drop good loot!" or his irrational hatred of orphans. Even if Gilbert has moved on to his new gig on the Double Fine Adventure, the writers still come up with some seriously great comedy bits throughout the game. The gameplay itself is fairly good too; it's generally just your average Diablo stuff, but nicely simplified. The only real unique aspect is weapon management. DeathSpank will automatically throw on any new armour you find, so it's just a matter of choosing what weapons to carry. You can wield four at a time, and each one is bound to a separate button. There's a wide array of swords and other melee weapons, ranged pieces, justice attacks that use up your justice meter and even one shot weapons like grenades. By picking from a ton of combinations of type and elemental damage, you can come up with ideal combos. But aside from that unique system, the bizarre mix of genres and time periods your armour comes from and the very amusing item descriptions, expect your typical action RPG gameplay here. Still, action RPGs are almost always a good time, and the generally fantastic humour keeps things amusing and light hearted. If you're an action RPG fan looking for something quick and fun to amuse yourself with before Diablo III or Torchlight 2, The Baconing is a pretty great game to fill that void with. I'm normally not much for competitive multiplayer games, but occasionally one spin on the tired deathmatch formula gets my attention. Plain Sight is a perfect example of a unique multiplayer game I can get behind, and it completely drew me in with the unusual and addicting gameplay. 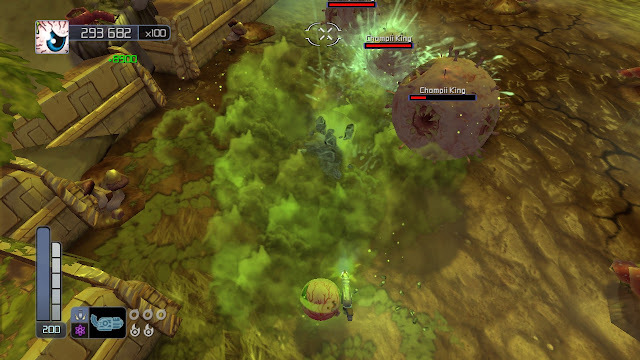 If you're a fan of trying out atypical multiplayer titles, you really need to try this game. Plain Sight is a largely multiplayer only title. 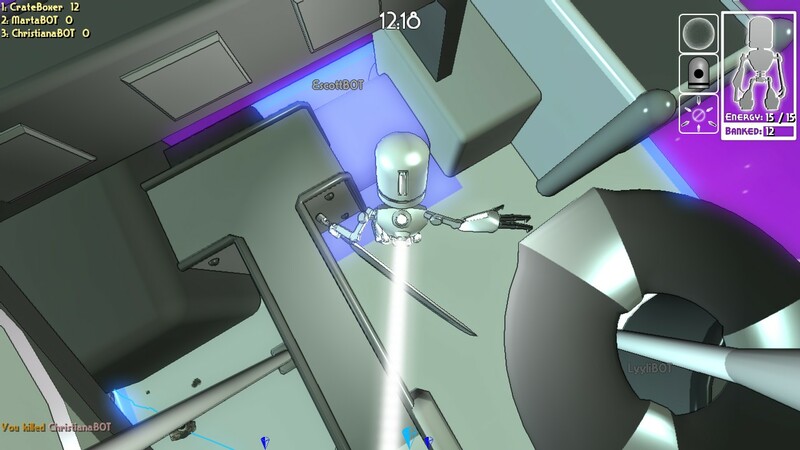 There are bots to practice with, and tons of maps to try out, but the total focus is on slicing up other players online. In Plain Sight, you are given control of an extraordinarily agile robot ninja. You can run, jump, cling to walls, charge through the air and generally play havoc with the laws of physics. Complicating this mobility is the gravity; each level is set on several small spherical objects and set-pieces very much in the style of Super Mario Galaxy in terms of gravity. You can leap off of the edges and circle down to the underside of the level, or launch yourself towards smaller moons and platforms to attempt an aerial advantage. On it's own, controlling your robot is a ridiculous amount of fun as you fling through the sky, bouncing off anything in your path. But your robot ninja is not simply a robot ninja because it is agile. Your robot carries around a great big katana to duel other robots with. 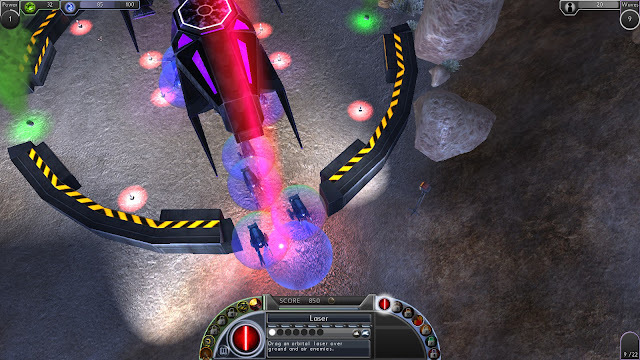 By holding down the left mouse button when a target surrounds an enemy, you lock on. When the target turns red, you have to release the mouse button to rush towards your unlucky target and chop them up. With this easy mechanic, the game becomes a simple matter of running around and trying to spot enemies before they spot you. 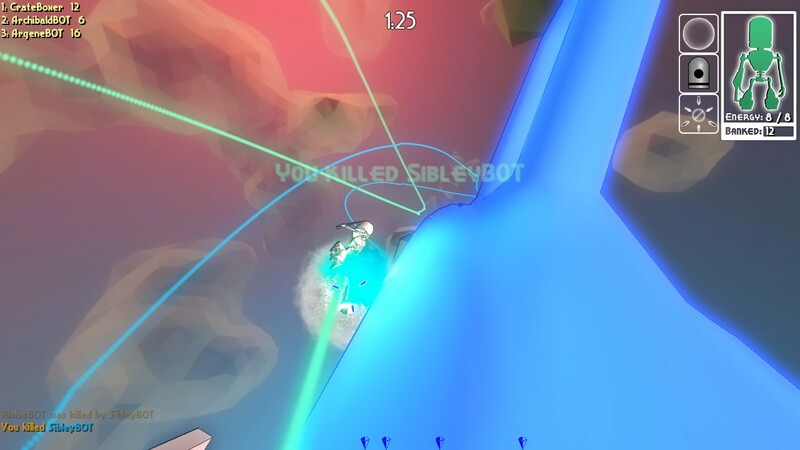 Every time you kill a robot, you steal all their energy (kills) and grow larger and more visible. When you have enough energy, you simply self destruct (with as many enemies as possible caught in the explosion) and bank those points for the end of the round. It's fast, it's fun and it's quite unlike anything else I've tried. There's a fun metagame of perks to equip, which you unlock by playing online, and within the games you can earn XP to make your robot faster, deadlier and even buy blocks and shields. 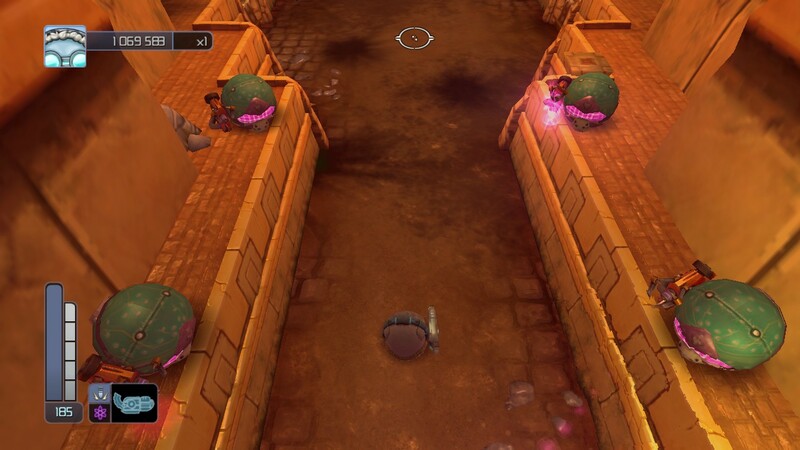 It's got all the hallmarks of a great addictive multiplayer shooter. You know, except the shooting. Instead, Plain Sight has something even better. Are Madballs a thing? I'm not sure if it's that I'm too old, or just not old enough, or it's my tragically Canadian sensibilities, but I sure haven't heard of them. But they're back, and starring in a neat arena shooter with a bit of platforming to it and more than a tiny bit of COD/Battlefield influence. So yeah, you Madballs fanboys waiting for a follow-up to Escape from Orb! with your favourite characters Occulus Orbus and Horn Head? It came out three years ago, so you probably already have it, but it's in a bundle now! I'm just not entirely where it fits into the Madballs universe canon. Ok, but seriously, even if I don't get shivers of nostalgia for playing as an eyeball who sounds like Sonic the Hedgehog (I spy with my little eye! ), I can appreciate that this is a pretty good shooter. The vast majority of it revolves (ha!) around controlling your ball and shooting every other ball you run across, whether they be Babo, mercenary or otherwise. It's more or less your average top down shooter, but from a third person camera perspective. If you like other arena shooters in this style, you'll probably be right at home. But it's not entirely straightforward, as there are a couple of neat wrinkles in the mix. There are secrets to find and multipliers to earn, plus a few tricky sequences that wouldn't be entirely out of place in a level of Marble Madness. The other major wrinkle is the class system and use of unlocks. 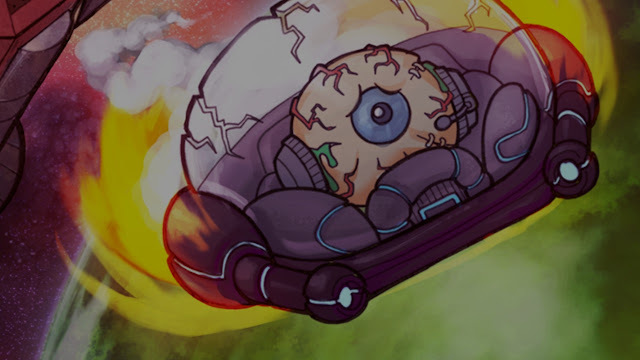 While you begin the game with just the basic class unlocked (eyeball/guy with horns), getting kills and achieving goals slowly unlocks new classes, new weapons to pick up, new types of weapon modes and new abilities for your classes to use. It's just as addicting here as it is in Call of Duty and it's imitators, and by spreading the goals across characters and weapons the game encourages trying everything out. The class system is like most team based class shooters at first. When you start a level, you can pick your icky ball and weapon, but you're locked in to that choice afterwards. However, throughout the levels you can pick up a different weapon that you find (throwing your old one away) or come across a one time use transporter to change into the class specified. Generally the game will throw a couple of the best choices for the upcoming level segment, but it does offer a bit of strategy and decision making when figuring out which class and weapon combo will be your best bet. The weapons and classes are all about equal, with different pros and cons that make the idea of switching based on the situation appealing, but the limited constraints on changing classes and weapons makes it all the more important to consider the possible downsides to a swap. Overall, Madballs in... Babo Invasion is an absurdly named title, but it's also a fun arcade style take on your standard class based shooters. There's a ton of multiplayer modes, full fledged four player coop and plenty of stuff to unlock. It's pretty great, especially considering it's a licensed title based off of a toy from the 80s, an era not known for fantastic video game license material. 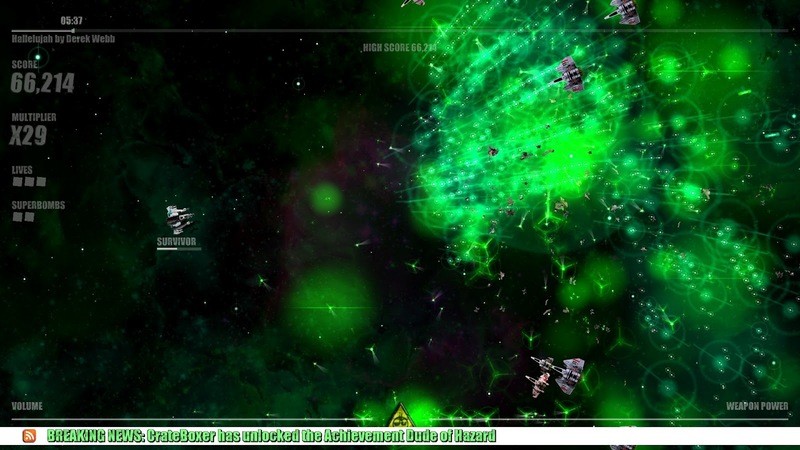 Beat Hazard is a very classical twin stick shooter. You move with the keys/left stick, and you aim with the mouse/right stick. What more could you want? Probably a lot of things, because there are a ton of twin stick shooters out there. Luckily, Beat Hazard offers a pretty unique twist on the proceedings through it's procedural generation based on music. It's also a fantastic title. Beat Hazard doesn't offer the traditional slate of levels, instead prompting players to pick and choose music from their library. While the interface for browsing your computer folders could be a little better, it's not hard to navigate to your music horde and start picking. Once you decide on a song and difficulty, you need to fight oncoming waves of enemies while your tune blares in the background. 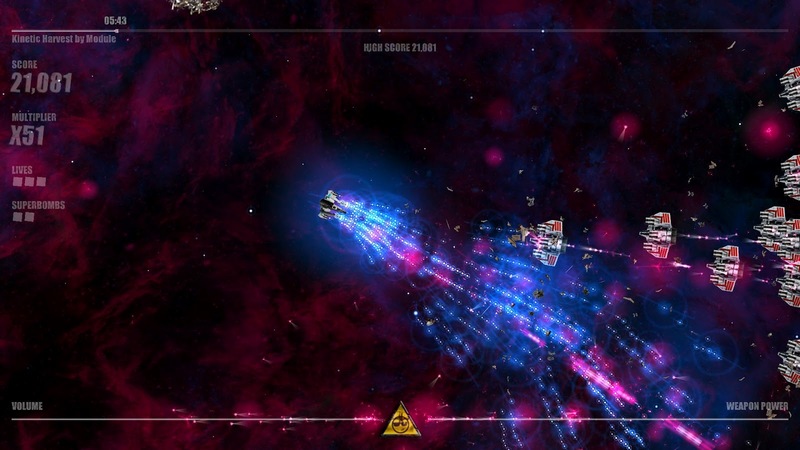 The strength of your enemies and the power of your attacks are directly influenced by the beat and tempo of whatever song you choose, so a low acoustic cover will generate an easy, low stakes level, and a thumping techno track will lead to a screen completely filled with a bullet hell shooting match. Speaking of filling the screen, the game is absolutely full of visual pop. Everything flashes and sparks and glows and explodes, and it's quite an intense amount of visual feedback. In my humble opinion the graphic style is fantastic, and makes the game look insane and exciting, but the fact remains that the visuals are a borderline safety hazard. If you're sensitive to flashing lights, you'll want to just skip this one. Now, I should warn you that as of this writing, the game does not include the DLCs. 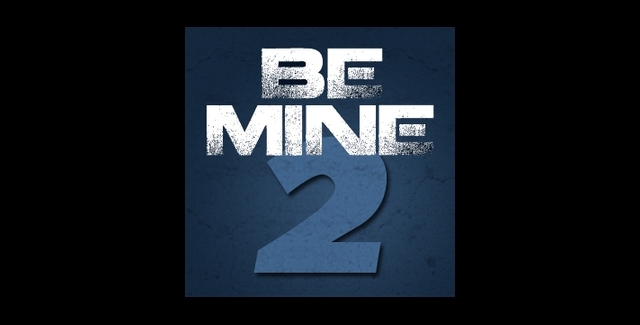 If the Be Mine 2 gets to $50,000 then the Beat Hazard DLC will be thrown in, but until then you're stuck with the classic edition. The DLC adds things like support for iTunes music, online coop as opposed to just local, new weapons, a perk system and the ability to adjust the graphic intensity further. It also adds in my favourite feature, which is support for a survival mode that uses a variety of internet radio stations as the source. It's a fantastic way to find new music and enjoy a bit of randomness to your game, but it's an option sadly lacking in the base game. That's not to say Beat Hazard is a bad purchase; indeed, it tops Audiosurf as my favourite procedurally based rhythm game. But I would say the DLC is borderline required for the best experience. Of course, there's a good chance it will be unlocked anyway, and it's only $5 to buy separately. And even without the DLC, the great music+explosion gameplay is all intact. Overall, it's a great evolution of arcade games to become more personal, and therefore more fun. I liked Sol Survivor a lot. That might not be the most alluring or interesting of intros, but I do! It's a very well designed and straight forward tower defence game. It looks good, there's a wide variety of towers to use and enemies to explode, and the gameplay is interesting and hands on without straying away from the basics or becoming too gimmicky. If you're looking for a new tower defence to sink some time into, Sol Survivor is an excellent choice. Tower defence is a tricky genre. A lot of people really like it and will consume anything in the genre, and with good reason. It's easy to understand, it's fun to puzzle over, it's based on things most gamers like (upgrades) and it invokes that addicting one more turn/wave mentality of all good strategy games. Of course, it has a fair share of detractors who claim the genre is too hands off and overdone. There's a bit of truth to this of course; there are a disproportionate amount of tower defence games out there, and not nearly all of them are all that great. Plus it's true that the player is often delegated to the sidelines for 90% of the gameplay in these games. This makes it hard to create a tower defence to break past both issues and stand on top of the genre, and it's a goal Cadenza achieves almost perfectly. As I mentioned in my overview of Defense Grid, there are generally two approaches to the tower defence genre: you can make it straightforward without any major twists, or you can take the tower concept and fuse it into another genre. Both Defence Grid and Sol Survivor opt for the former route, but both are extraordinarily different. 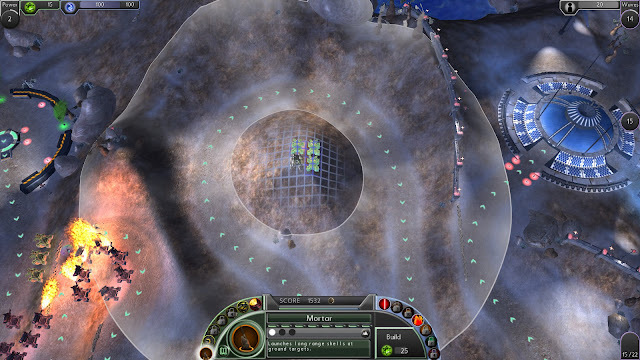 Defence Grid concentrates on expanding your toolbox and providing more than enough resources, but limits your placement, while Sol Survivor does the exact reverse. In each of Sol Survivor's expansive maps, you have more than enough space to place dozens of towers but you won't have the funds to do so at first. You also have a more limited set of toys; each general you play as skews towards a certain limited palette of tower types, so while there are tons of towers to work with, you never have all of them thrown at you at once. This allows for far more improvisation and off the cuff planning, and while it can lead to balance issues (though the game is fairly well balanced from what I played) it also leads to a lot of creativity and strategy. The way Sol Survivor handles the problem of forcing the player to be hands off is by giving the player a massive non-tower arsenal to work with. Each general is equipped with just as many countermeasures as they are towers, and you are endlessly encouraged to use them. 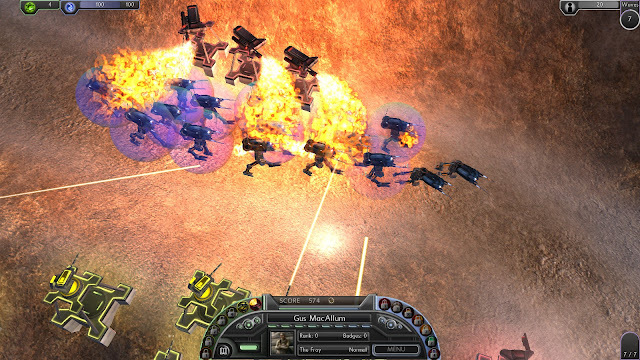 Often towers will not be enough, and it falls to player to use an orbital strike laser or an artillery of fire. Each of these attacks expends energy, but you gain it back very quickly and there's a hard cap on the amount you can horde away. Mix in the cool downs for each attack, and the game seems built to encourage using every weapon in the toolbox equally. 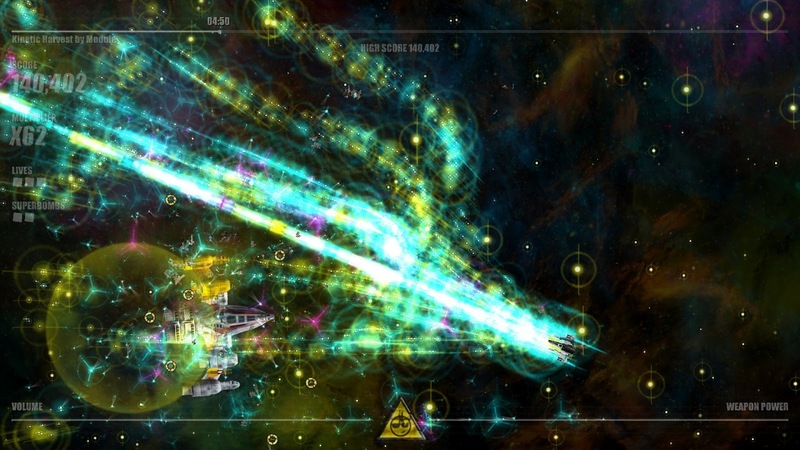 It's a bit of a genius system, really, and while many games have one shot weapons like this, Sol Survivor manages to make it critical for victory and also quite a lot of fun to toy around with. So overall, Sol Survivor is a very good, very well designed tower defence. The only downside I could note was a lack of a fast forward option, which makes the first few waves quite dull. Aside from that, you have a fantastic classical tower defence that keeps you hands on and engaged. What could be better? Killing Floor is this bundle's version of a beat the average bonus, only unlocked for players who chime in with over ten dollars. Does your extended charity pay off? If you're a big fan of team based survival shooters, then yeah. It pays off nicely. 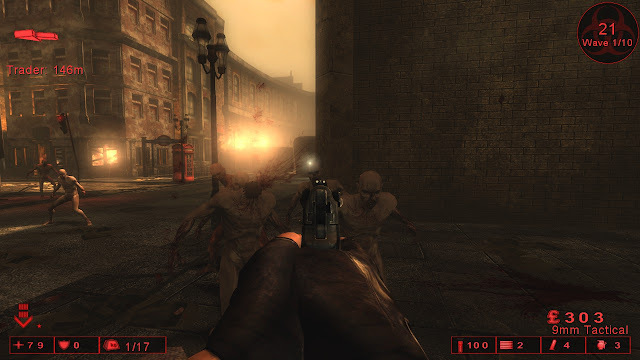 Killing Floor was originally designed as an Unreal Tournament mode that was blown up into a full game. All of England has been ravaged by a deadly mutating virus that turns people into horrible monsters with swords for hands and pukey mouths and such. The variety of enemies is pretty standard to the general compliment of zombie mutations (fat pukey one, stealthy jumpy one, brutal punchy one, chainsaw guy) but the visual design of the enemies is still nice, creative and gross. As a group of one to six blimey Englishmen, you have to drop into an area of post apocalyptic Britannia and kill every last monster in the area as they attack you in conveniently timed waves. In terms of gameplay, Killing Floor basically knocks it out of the park. The maps are incredibly well designed in general, with plenty of natural choke points and opportunities for ambushes. The gunplay feels smooth and just right, and the slow motion camera that kicks in after a particularly awesome kill looks amazing and feels downright, for lack of a better term, badass. There's a ton of weapons to choose from, each with a different feel and a list of pros and cons to work with, but it expands well beyond the usual slate of weaponry. If you feel like a katana is the best bet for slicing up zombies, or a hunting crossbow, or a flamethrower, then you'll be pleased that you can tote all of that and more. Like any good horde mode shooter, the game is all about collecting money (the fact that it's measured in pounds infinitely amuses me) and buying better weapons with it between waves. Like I said, there's a ton of weapons to pick from, but your limited carrying capacity means you'll have to make some tough calls about what to grab. 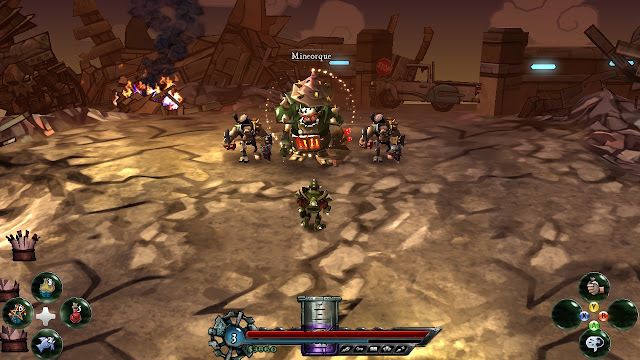 To assist with the killing and add in a bit of cross match progression, each player can pick a perk that enhances a particular style of combat. Doing goals associated with said perk will cause it to eventually level up and grant a better bonus. The more you play as a particular class, the better things get for you, eventually allowing you to start with better default equipment and get deep discounts on the top tier gear of your class. I should compliment the team at Tripwire for being generally fantastic about supporting the game at a nearly Valve-like level. 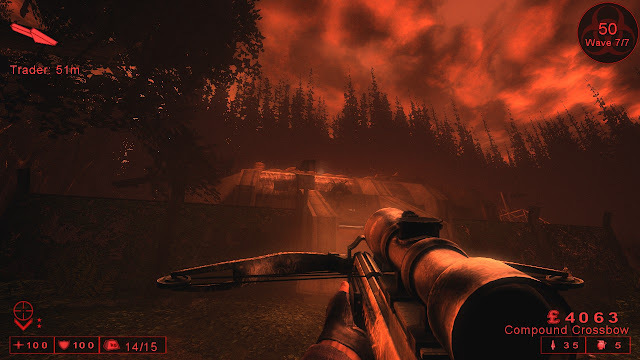 Since release, Killing Floor has added lots of new maps, weapons and characters. They've also shown excellent restraint in charging for these updates, with only character models in their DLC store. This means that you get a game that's always updating and getting better, and all for the price you paid for it in the beginning. It's little things like the great support that make this an easy recommendation. The one slip up is that the game's difficulty seemed tuned for six players all of the time. As far as I'm aware, there's no effort to diminish the challenge based on how many people come along. It's also a bit uneven on the curve, with beginner being way too easy, normal too hard for less than three experienced players and the rest being downright unapproachable without a coordinated group. With this difficulty in mind, playing on your lonesome won't be very entertaining. But as a coop option for you and some friends, Killing Floor is a fantastic indie alternative to the Left 4 Deads and the Horde modes of the mainstream. April has been a fantastic month for indie bundles so far, with Groupees presenting the latest in a line of awesome deals. If you like the look of the games and have some money you'd like to donate to those who need it, head over to their page now. There's a few bonuses in the mix too. Every bundle sold gets a copy of a special Be Mine 2 ep of indie music. Every bundle also gets three bonus albums, consisting of Your Sparkling Death Cometh - Falling Up, Myths - Moonlight Brides and Live at the Troubadour - Urge Overkill. Everyone also gets access to the first issue of an indie comic called Cyber-Chicken and The Red Skulls, an indie film. Bundle owners who pay the Killing Floor tax will also recieve an additional album called Special Collection from Eligh and the Return to Wonderland graphic novel, which is published by a company that seems very dedicated and hard working, but whose website was deeply embarrassing to open while my girlfriend was standing behind me. Like always, you can check up on me and my reviews on the usual suspects of Twitter, Facebook and Google Plus. Aw, I must have muddled that up in my head. Thanks, fixed.